There are now more pet cats than dogs in the North America. Improved nutrition, prevention of infectious disease and advances in veterinary medical care have resulted in our cats living longer and healthier lives. In the last decade in North America, there has been a 15% increase in the number of cats over ten years of age and the proportion of the feline population aged fifteen years or older has increased from 5% to 14%. What are some of the changes that occur in aging cats? "Lack of exercise can result in a fall in energy requirements of up to 40%." Many aging cats are affected by osteoarthritis, which contributes to a lack of activity. The lack of activity then contributes to stiffening of the joints and worsens the symptoms of arthritis. Reduction in exercise may result in reduced muscle tone, which may further reduce the cat's ability to jump, climb or exercise. When coupled with reduced activity, common in older individuals, this lack of exercise can result in a fall in energy requirements of up to 40%. If a cat maintains a good appetite, its daily food intake must be reduced to prevent excessive weight gain that can cause obesity-related health issues. Inappetence or lack of desire to eat may develop in some senior cats, since the senses of smell and taste become dull with age. 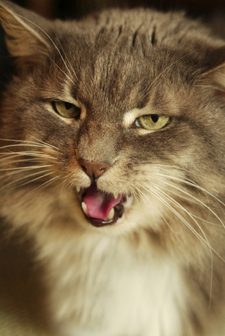 Periodontal (dental) disease is common in senior cats, and may contribute to inappetance. Intestinal function, including the ability of the intestines to absorb nutrients is reduced in many older animals. Geriatric or degenerative changes in the liver, kidneys, and endocrine system will decrease the efficiency of digestive and other metabolic processes. Thirst is often decreased, causing an increased risk of dehydration, especially when combined with concurrent renal insufficiency, a type of kidney disease common in older cats. How might these aging changes affect my cat's response to medication? "Changes in physiology also affect the way many drugs are metabolized." Although little is known about the feline immune system, it is generally assumed that immune function deteriorates with age. This may in turn result in a reduced ability to fight infection or destroy neoplastic (cancer) cells. 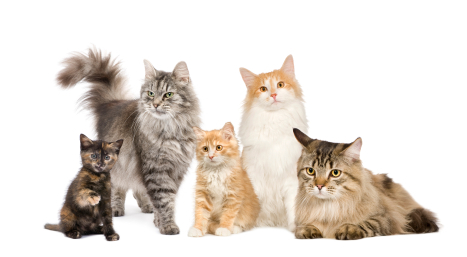 However, if your cat's lifestyle means that it has a low risk of contracting certain of the common preventable diseases, your veterinarian will advise you on the most appropriate vaccination program for your cat based on its physical condition and lifestyle. There is no simple answer to this question, and it should be discussed with your veterinarian. The proper advice for your cat depends on the specific disease being treated, and whether the treatment may lead to a cure or is aimed at controlling clinical signs. It also depends on how ill the cat is. Often, older cats do not tolerate excessive physical handling or environmental change, so while veterinary medicine may be able to offer complex therapeutic options, these may not be an option for your cat. It is important that each case be assessed individually. Treatment should not be attempted where it will be poorly tolerated for medical or temperamental reasons. "In older patients diagnosis and treatment may be complicated by several concurrent disease processes." You should remember that, while young cats usually have only one disorder at a time, this is often not the case in older patients, where diagnosis and treatment may be complicated by several concurrent disease processes. Most cats age gracefully and require very little. Since older cats do not generally respond well to change, it is important that any changes be introduced slowly. Elderly cats should have easy access to a warm and comfortable bed, situated where the cat can sleep safely without fear of disturbance. You should feed your older cat a high quality, easily digestible food such as a premium brand senior diet. Although specific nutrient requirements are not yet determined for senior cats, it should be assumed that any older cat has some degree of subclinical or underlying disease, particularly of the kidneys and liver. Hence, a diet with moderate protein restriction is usually recommended. Geriatric cats should always have easy access to fresh drinking water. As cats age, some will experience a reduced ability to control urination and defecation. To reduce the risk of "accidents", it may be necessary to provide multiple litter boxes located on each floor of the house that your cat may use, and near favorite sleeping and eating areas. "The earlier we can diagnose a disease, the more the likelihood that we can slow or reverse it." The aim of any senior care program is to maintain the quality of the patient's life and to slow the progression of age-related disease. Because most of the chronic diseases we see in senior cats are slow to progress, early recognition is usually only possible through diagnostic tests. The earlier we can diagnose a disease, the more the likelihood that we can slow or reverse its progression and maintain a longer period of high quality of life for your senior cat. Senior cats should have regular health checks (every six months). Senior care programs usually include a thorough physical examination, blood and urine screening and chest or abdominal radiographs. Body weight should be recorded regularly and booster vaccinations should be given as determined by your cat's lifestyle. We will provide you with additional details about our senior care programs upon request. While it is true that "old age is not a disease", older patients do merit special attention. This is important so that if your cat develops disease, we can recognize and treat it as early as possible, thereby maintaining its quality of life for as long as possible.